If we start addressing oppression by countering it with the humanness of who these kids are, we’re more likely to keep them engaged and feeling a sense of belonging. For African-American students, data, alongside societal attitudes and stereotypes, often present a negative picture: a wide academic achievement gap separating them from their white peers. Higher rates of discipline and absenteeism. Discrimination by other students, teachers and the larger community. And just last summer, a study indicated that black girls, from an early age, are perceived as more aggressive and sexual – less innocent – than white girls. But what if, a University of Washington education professor reasoned, black students were encouraged to explore and embrace their racial identity at school? Could cultivating a positive self-image, exclusively around race and ethnicity, make a lasting difference in student performance and confidence? The answer, Janine Jones found, was promising. In a paper published this month in Psychology in the Schools, Jones describes her work last spring at a Seattle-area middle school where African-American girls participated in an after-school program designed to create community around and pride in black culture and identity. Those who did expressed greater confidence and reported, both on their own and through teachers, more connection to and involvement with school. 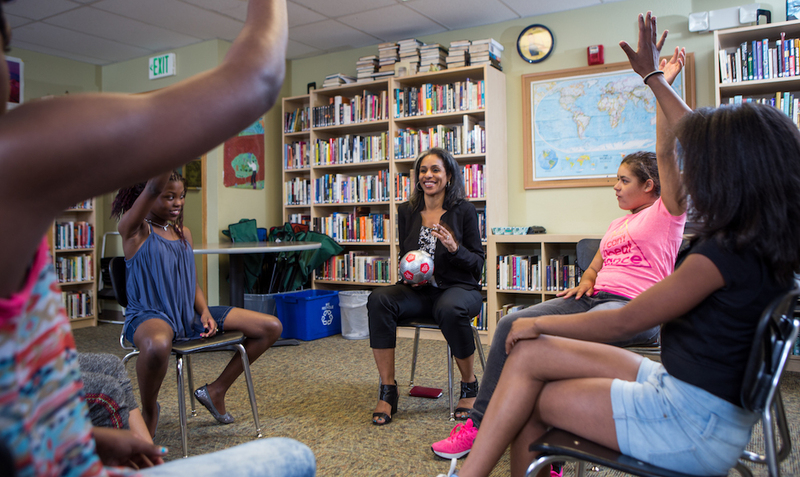 For this study, Jones adapted a cultural enrichment curriculum called Sisters of Nia (a Swahili term for “purpose”) and, with the help of the principal at a Federal Way middle school, invited African-American girls to join an after-school program that met once a week for six weeks. In Jones’ abbreviated version, the cultural program focused on a new principle each week: purpose, unity, respect, self-determination, cooperation and believing in oneself. The girls participated in interactive lessons, discussing issues such as myths and stereotypes of African-American women, and recorded their thoughts in a journal. The program culminated in a Kwanzaa ceremony, which aimed to further bond the girls and symbolize their achievement, Jones said. Meanwhile, a control group formed to focus on a mindfulness curriculum; at the end of the six weeks, the curriculum swapped, so that the cultural group then focused on mindfulness, and the control group received Sisters of Nia, for another six weeks. The groups were small — half a dozen girls in each. But while the size appeared to encourage community-building in the Sisters of Nia group, Jones said, the control group never really got off the ground. Attendance was sparse, the mindfulness program appeared to hold little interest for the girls, and by the time the curriculum was scheduled to change, only two were attending at a time. The original Sisters of Nia group, on the other hand, took on the mindfulness activities and continued, on their own, to discuss the Nia principles and other ideas they had encountered. Jones and her research team used student and teacher surveys to gauge the girls’ self-concepts and ideas about racial identity, as well as their level of engagement in school — defined by multiple measures of their attendance, effort and attitude. The researchers found that, over the six weeks of the cultural enrichment program, school engagement among participants increased, whereas it decreased among students in the control group. Sharper differences were noted in measures of racial and ethnic identity, which were even more pronounced six weeks after the conclusion of the Sisters of Nia program. Among those participants, their degree of identification as African-American and their positive feelings about other African-Americans increased significantly over time. The girls also expressed a higher affinity for a “humanist” racial ideology, a belief that they fit in with people of all races, that their racial heritage has value in society and that their race should not exclude them from being part of the larger community. The fact that the girls reported these feelings long after the cultural program was over speaks to how strongly the ideas resonated with them, Jones said. There was no other direct connection to Sisters of Nia, she added, since the group leader was different for the mindfulness program, and none of the activities was related to the previous curriculum. Jones believes the findings point to ways to build community and identity among young teens. While this curriculum, and some of the related ideas about race, were specific to African-Americans, such ideas and lessons could be adapted for other racial and ethnic groups, as well, she said. Even more importantly, Jones said, learning about cultural diversity and heritage, as well as dispelling stereotypes, can be applied in whole-class settings, not just designated for certain ethnic groups. “It’s about how hearing the humanness of the other person — encouraging people to develop relationships with people who don’t look like them, makes all of us grow,” she said. Other authors on the paper were graduate students in UW School Psychology program, Lisa Lee, Alexa Matlack and Julia Zigarelli. This story was first published on UW News.